Fall is in full swing here (!) and along with decorating with bittersweet and baking apple and pumpkin recipes, my traditions include plugging in the instant-hot-water faucet that I’ve unplugged over the summer. It was one of the unexpected things when we moved into our house that we’ve really enjoyed. I can make tea, oatmeal, and hot chocolate in an instant. I can warm up a baby bottle without the microwave. And today I found yet another use. I have a few pieces of jewelry that have been in my personal collection for a little while, and try as I might they wind up tarnished. 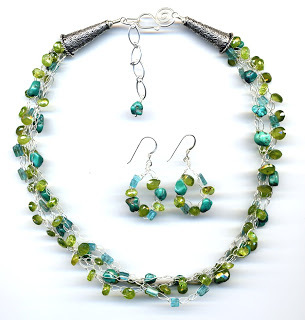 Normally I use a silver polishing cloth, silver dip, or throw the items into the tumbler to polish up the sterling silver, but these particular pieces contain turquoise and freshwater pearls which are easy to harm with traditional polishing techniques. And the wirework prevents me from reaching all the nooks and crannies. I remember back a few years reading about a method using hot water and baking soda, so I tried it. I lined a baking dish with aluminum foil, then poured in a few teaspoons of baking soda and salt. Then I filled it with water from my instant-hot tap (you can boil water separately and pour it in), stirred it up, and put my jewelry in. It can take a few minutes, but I could see the change right away. Bright, sparkly silver with no damage to my turquoise or pearls, and no chemicals. Using baking soda and hot water is a proven polishing agent even in bespoke handmade jewellery pieces. Good move for doing the same on your collection and thanks for sharing some useful instructions too.